You'll be £25.00 closer to your next £10.00 credit when you purchase Political Wings. What's this? This is the first biography of Rt. Hon. 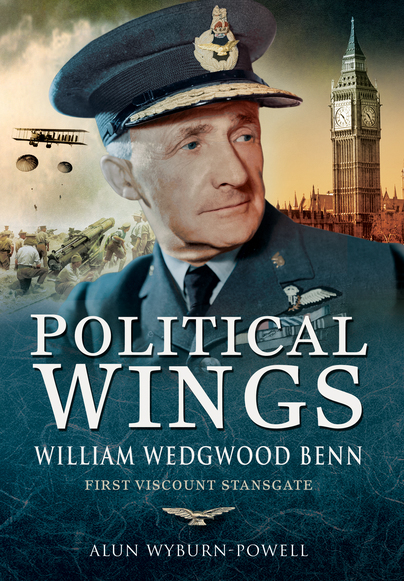 William Wedgwood Benn DSO, DFC, first Viscount Stansgate, cabinet minister under MacDonald and Attlee, Air Commodore with active service in both World Wars, defector from the Liberals to Labour over his dispute with Lloyd George, and father of Tony Benn. Benn served in the army and RAF during the First World War (when he took part in the first parachute drop behind enemy lines at night) and in the Second World War he reached the rank of acting Air Commodore). His eldest son Michael, heir to the viscountcy, died on active service with the RAF, leaving his second son Tony to inherit the title and a seat in the House of Lords. Before his death, Tony Benn gave extensive interviews for this book. His brother, David has also provided interviews and material, as have other members of the family including Stephen Benn (now the third Viscount Stansgate). Extensive paperwork left by William Wedgwood Benn (now in the Parliamentary Archives) including his diary and unfinished, unpublished autobiography were all utilised in the construction of this biography. Alun Wyburn-Powell has managed to construct a biographical study of real force, weaving together snippets from Benn's own private papers with insights from his family and colleagues in order to create an authentic impression of Benn and the times in which he lived. Benefiting from the reminiscences of members of the Benn family, including the late Tony Benn, Wyburn-Powell draws a convincing picture of this, in some ways, rather eccentric individual. This is a fascinating book about a fascinating subject. Quite why William Wedgwood Benn has received little recognition is one of life's mysteries, but the author has done a good job of correcting this omission. P&S readers who have a strong military history interests will find this a very interesting book for the military experiences of Viscount Stansgate. Those interested in politics will find it one of the most fascinating books about a political figure. Those who have neither interests will still find this a very interesting biography and an illumination of some of the mysteries of left-wing politics in Britain. As a primer on the parliamentary system, this book shines, especially to a non-British readers. A stunning biography of William Wedgewood Benn, better known as the father of the veteran Labour politician, the late Tony Benn. Following his distinguished war record and many honours such as the DSO, DFG and Croix de Guerre. The in depth story of William Wedgewood Benn's real stature both as a serviceman and a politician in this book which spans both World Wars and beyond. It is written by a distinguished political historian and is particularly interesting and highly revealing and sure to appeal to both the historian and the student of political leadership. The reader is left in little doubt that Tony Benn's father, who was awarded the DSO, DFC and Croix de Guerre, was a very special individual indeed. Above all, he was evidently an exceptionally decent man who successfully combined the qualities of both physical and moral courage. This is an unusual book that will appeal to both the military historian and student of political leadership. Wyburn-Powell has written an important contribution to not only the history of the Liberal Party in England but also to the political life of the country more generally. Most people will be far more familiar with the later generations of the Benn political dynasty including Tony Benn and his son Hilary. This book explores precisely how that dynasty was created and the formidable man behind it. One is struck how far to the left the First Viscount Stansgate was on many issues and it certainly sheds light on Tony Benn’s later unflagging support of various underdog causes in a type of emulation of his father. Overall one is left wanting to read more about the fascinating history of British politics in the interwar years where elections happened much more frequently and politicians were far more likely to cross the floor – in some cases back again not long after. As much as a personal history of William Wedgwood Benn, this book is also a history of the fall of the Liberal Party and the rise of the Labour Party with Benn as a participant and, at times, unsung catalyst. Alun Wynburn-Powell has done an extraordinary job of research on William Wedgwood Benn who unlike his son Tony, did not publish extensive diaries in his lifetime. The writer also assumes the reader has some knowledge of the workings of parliament and the British political system. However, even with a rudimentary understanding and interest in Benn it should provide and enjoyable and informative read. When anyone thinks of the British political dynasty they always start with Tony Benn the Second Viscount Stansgate, the man who disclaimed his title so he could sit in the House of Commons. The forgotten member of that dynasty is often William Wedgwood Benn, the first member of the family to be elected to Parliament then raised to the Lords. To many he is just the father of Tony not the beginning of a Political Dynasty. Political Wings by Alun Wyburn-Powell is one of the shortest political biographies of the year but also one of the most interesting, no wasted words here. This is one of the most well researched and engrossing reads that charts his rise from the East End to Parliament as well as becoming an Air Commodore to being a member of the government. Like many Members of Parliament, he won and lost Parliamentary seats at elections but unlike many he went from the Liberal Party to the Labour Party when it really was new. How he represented two Scottish and two English Parliamentary seats, was offered a post by Lloyd George but went on to sit in a Labour Government. Benn at this time helped to enhance the Labour Party’s reputation, and was well known for his efficiency at attacking the Party’s opponents. Benn, like his son would do to Chesterfield, lost Aberdeen due to neglecting the constituency work, but he had the excuse of a very heavy workload as a Cabinet Minister and Aberdeen not being easy to reach from London. In 1931 when he did lose the seat it could also be blamed on the very poor electoral showing of the Labour Party across the country, similar to that in 2015. What I do like and that has been mentioned often even in recent times is where the Stansgate name came from, a flat pack home they built in Essex. The book tells of the career of William Benn’s father and how it had an impact upon William and some of the most interesting passages are the early years. There are also interesting passages concerning the First World War and very much the lack of accountability to Parliament then is very much the same as today. One thing that both William had in common with his son Tony, is evident in this book in that they were both workaholics and neither ever really retired from the political sphere to take a backseat. What this book did do is remind me that Winston Churchill only ever did win one election that of 1951 but also he became a grandfather. Political Wings is one of the most interesting reads about the start of a political dynasty that I have read in a long time. This book is clearly written and researched which makes it a pleasure to read without the padding of other books about the Benns. An important book from both a political and historical period when there was so much confusion in the early twentieth century, read and enjoy. Awarded the Best of British 'Book of the Month', August 2015. An excellent job of weaving together the many strands of a complex life…as well as filling in the background of the Benn family. This brilliant biography casts light on an important overlooked figure. A must read for anyone wanting to understand British politics in the 20th century…wonderful reading about the father and in doing so discovering more about the son. The descriptions of his flying activities in seaplanes and later land planes over Egypt and Italy gives the reader a real insight into what it was like. There is no question of his bravery and 'press on' attitude…full of Boy's Own adventures. William Wedgwood Benn, first Viscount Stansgate, was an important figure in the politics of the Left…casts much light on the evolution of British radicalism, and on the legacy which he bequeathed to his son, Tony. Sparkles with fascinating detail…a remarkable story of Liberal and Labour politics in the first half of the twentieth century.